Hi all... took a year or so off from the boards but will be bringing my Minor League updates back for all of you in 2018. Should be another exciting year on the farm. The next wave of Baby Bombers are coming. It’s hard to believe, but the minor league season begins on Thursday. The Yankees have a whopping eight affiliates, but only four play before the draft. With that in mind, it’s worth checking in on the rosters for the teams preparing to play. Of course, these are subject to change, but they should give us a good idea of who’s playing where. At the beginning of spring training, one would have expected the RailRiders to field the most interesting team in the system. The Yankees have a ton of top prospects so close to the show. The Triple-A squad figured to be among the most entertaining in baseball. Then injuries struck, and the top names left are Torres and Adams. That’s not a bad thing, though, and more firepower could be on the way with the return of Clint Frazier and Miguel Andujar. The latter figures to be sent down when the big league club gets an extra outfielder. High-A Tampa hasn’t finalized their roster yet, seeing as they only have two outfielders listed. That open spot figures to belong to Estevan Florial, one of the team’s top prospects. There’s a lot of young talent on this squad, including the flame-throwing Abreu and intriguing Loaisiga. Plus, Holder has torn the cover off the ball for almost a year now. Tampa will be pretty fun to follow this season. The RiverDogs may not have many household names, but that can change in a hurry. This talented group features Garcia and Molina, who could grow into their own this season. Plus, the Yankees have a knack for turning unheralded players into legitimate prospects in a hurry. Keep your eyes open here. Is this where we look for Mets news? Where's Frecier Perez? Thought he landed on the Charleston roster again, which I didn't care for. Believe he is starting in Tampa. Hey diehard, Did you finish school and get a job . How the hell are you. There’s a few things going on with the Triple-A roster. One, they have more position players coming. Cody Asche was added in a trade earlier today and apparently Trayce Thompson will join the RailRidersas well. Also, Ryan McBroom’s Twitter account indicates he is with Scranton despite not being listed on the roster. And Miguel Andujar figures to rejoin them soon enough. So yeah, they have more bodies on the way. There was a point in the offseason when it looked like the Yankees would rely heavily on young players. Instead, they loaded up the Major League roster with veterans, and the RailRiders should be the beneficiaries. No. 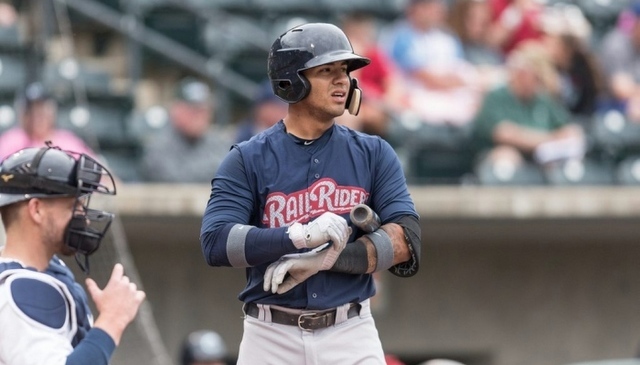 5 overall prospect Gleyber Torres, who played 23 games for Scranton/Wilkes-Barre before undergoing elbow surgery in 2017, is healthy and back after the additions of Brandon Drury and Neil Walker squeezed him out of the Bronx infield. No. 65 Miguel Andujar is currently with the big club when injuries opened up a roster spot, but he'll likely bring his impressive offensive tools back to Triple-A soon to get regular playing time. No. 76 Chance Adams doesn't have much left to prove after posting a 2.89 ERA and 1.08 WHIP over 115 1/3 Triple-A innings last season, but he'll try to show his four offerings can get Major Leaguers out. Graduated top-100 prospect Clint Frazier is likely headed back to the IL when he returns from his concussion. Justus Sheffield, Domingo Acevedo, Dillon Tate and Thairo Estrada might not be too far behind, giving the RailRiders a loaded roster. Life is good buddy. Yes, I am in the real world now... how's it going with you?